Nestled in a quiet valley between two mountain ranges and in the shadow of the birthplace of St. Francis of Assisi, the villa La Fattoria del Gelso is an ideal place to discover the treasures of Umbria and the secrets of la dolce vita. This luxurious and comfortable villa is set on a tranquil 40 hectares working farm in one of Italy's most fertile regions, yet is just a short drive to some of the Italy's best artistic, cultural and culinary treasures. Whether you are a large extended family, families travelling together, a group of friends or a tour group meeting one another for the first time, La Fattoria del Gelso offers the right amount of luxury, familiarity, privacy and togetherness to make your Italian vacation one that you will remember for a lifetime. The main building of the villa is a two story farmhouse constructed in the 1700s. The farmhouse houses 8 spacious king bedrooms, 5 on the upper floor and one on the lower floor with a private entrance. A separate annex, just across the courtyard from the main building, houses two additional king bedrooms, which are adjoining and handicap accessible. Four of the bedrooms on the upper floor form two two-bedroom suites, each pair sharing a bathroom and capable of being closed off to give families more privacy. Each of the bedrooms is furnished with a king bed (which can be separated into twin beds) covered with fine Frette linens and decorated with authentic rustic Italian furniture. The main building has two large sitting rooms, with working fireplaces and with comfortable furniture capable of seating your entire group. One of the sitting rooms has satellite TV with dozens of channels of English language programming, sports and news. A desktop computer with a high speed internet connection is located in one of the sitting rooms and is at your disposal throughout your stay. Free, reliable high speed WIFI internet is available throughout the property if you choose to bring your own laptop or smartphone. A fax machine and copier is also available for your use and prepaid cell phones can be provided upon request. An enormous modern restaurant-quality kitchen, features a six burner gas oven, pasta making table, stainless steel refrigerator and plenty of working space for you and your group to make the perfect meal. Just outside the kitchen door is an ample garden where you will find the freshest vegetables and herbs for your meals. This large space is perfect for cooking classes, which we can arrange for you, or perhaps you would prefer to learn how to make authentic Italian pizza in our wood burning pizza oven on the patio outside the kitchen. If you are not the cooking type, a cook can be arranged for an additional charge. Outside you can enjoy the extensive grounds, tree-lined and surrounded by fertile green fields. In the distance the town of Assisi, birthplace of St. Francis, can be seen, its white walls and buildings dominating the valley below. A private pool and expansive patio are the perfect place to relax and enjoy the views and to discover that inner peace that led St. Francis to become the patron saint of birds, animals and the environment. Located just 15 minutes from the Perugia airport and the Assisi train station, as well as a short 10 minute drive from the SS75 highway, La Fattoria del Gelso is a perfect jumping off point for the historic towns of Assisi and Perugia, as well as the lesser known gems such as Spello, Spoleto, Bevagna and Montefalco. The owners, an American couple who fell in love with Italy over a decade ago and fed their addiction by establishing an Italian import retail store in the Washington, DC area, have extensive knowledge of and ties to the area. They can help you plan and organize tours of nearby towns and sights, visits to local vineyards (the villa is located along the famous Strada del Sagrantino - the Sagrantino Wine Road that winds its way through the hills here, welcoming visitors to enter and try this highly acclaimed wine), arrange cooking, language, photography or ceramics classes with local artisans or arrange transportation. Their local partners are available to assist you 24/7. La Fattoria del Gelso. The villa, the ambiance, the setting and the staff ensure that you will have a memorable vacation that you will be talking about for years to come. We started renting our villa in 2008 so we could share our love of Umbria and the treasures of Italy with the public. But in a sense, ours has been a much longer journey. Our love affair with Italy began nearly two decades ago when Bill was a student in the Georgetown University Law Center summer program in Florence (Fiesole). That three-month taste of la dolce vita, which we shared with our then one year old son, led to other extended visits to different regions, each its own journey of discovery of a people and place. Then, after attending a cooking class on the Italian Riviera in 1995 we partnered with the chef to establish an internet-based Italian import business that supplied artisanal gourmet food products from family-run Italian suppliers to eager American bellies. From those humble beginnings emerged our current business, Via Umbria, a fully blown retail store/fresh market/cafe/wine store/restaurant based in the Georgetown neighborhood of Washington, DC. After a decade of bringing la dolce vita to America, it seemed the right time to bring Americans to Italy, where they could truly experience la dolce vita firsthand, the way Italians do. So in March 2008 we purchased the beautiful villa La Fattoria del Gelso, a historic stone farmhouse situated on a 40 hectare working farm in one of Italy’s most fertile regions. With our extensive network of personal relationships in the local community, as well as our highly capable local staff, we can ensure that you will experience a side of Umbria that is not available to the casual traveler, that your vacation will be tailored to your unique personal desires and that all of your requests or questions will be answered with Yes. And while we enjoy the peace and quiet of being in the country, we also benefit from being a short 10 minute walk to the charming village of Cannara and enjoy quick, easy access to the highway. Our quiet villa is the perfect launching pad for exploring and discovering the beautiful and fascinating towns that make up this special corner of the world. 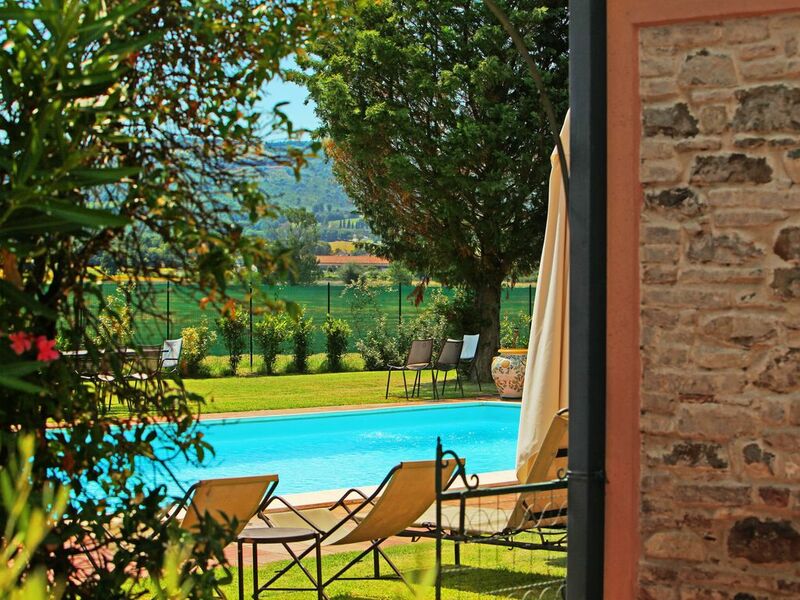 Picturesque views of nearby Assisi and Perugia as well as majestic Monte Subasio. Air conditioning units available on request in the annex. A full set of linens and towels is provided to each guest on check in. A mid-week change of linens is available for a modest fee. Free, reliable high speed wifi is available everywhere on the property. Windows PC in sitting room, with high speed internet (DSL) connection and networked laser printer. Free Wi-Fi access throughout the villa for visitors with their own laptop computer or smartphone. Two outdoor stoves - one a wood burning bbq grill, the other a wood burning oven for pizza making! Prepaid, rechargeable Italian cell phones available to your party upon request. Arrange in advance so you can leave your contact phone number with family and friends. Restaurant-style dishwasher washes a rack of plates or glasses in one minute. (2) Two full size refrigerators keep your food fresh and your wine chilled. Full compliment of utensils, pots, pans and appliances. If you send us a grocery list before your arrival, we can stock the kitchen for you for no additional fee. We also have an honor bar with wine, crackers, nuts, pasta, soap, bottle water and more. Ample dishware, including dozens of hand painted ceramic dinner plates, salad plates, pasta bowls and serving pieces bring la dolce vita to your table. Cook can be arranged upon request for an additional charge. Professional-level kitchen formerly used for on-premises restaurant. Perfect for cooking with a group. (2) SkyTV system, with many English language programs, sports and news is provided in two sitting rooms. DVD plays US and European region coded videos. Feel free to bring your own or browse our selection. (2) Two covered pool-side gazebos perfect for sunset cocktails or relaxing. Full patio by pool, with large hand painted ceramic tables for outdoor dining. Great selection of comfortable lounge chairs. How I Spent My Great Summer Vacation! Looking back I realized I had to chronicle one of the best summer vacations I’ve ever had. In July 2009 my wife and I put ourselves in the hands of Suzy and Bill Menard at Fattoria del Gelso, Cannara, Umbria Italy. What distinguished this vacation was the hands on warmth and guidance of Bill and Suzy and the entire staff. The updated farmhouse was wonderfully homey and afforded the privacy and comfort required for a restful vacation. The picturesque grounds are beautiful and clean. And after a day out and about, in and around the swimming pool we had a sweet early evening oasis to cool off and enjoy cocktails in. I traveled with my wife and another couple. Each day with the sun shining down on us we were treated to so much of Umbria that we had to plan for some down time. Suzy, Bill and staff helped us plan each day and addressed our needs as we went along, a custom designed on demand vacation. Days were filled with learning, relaxing and enjoying. There were trips to local wineries one of which we lunched at, tours of Assisi and Peruggia, which was also hosting the Umbria Jazz Fest, a private cooking class and evenings meals at the villa or at a nearby village restaurant featuring seasonal Umbrian fare. During our stay other guests included by chance, a prominent author, a news editor, an electronics engineer, and a CEO of a US Bio-Solutions firm. The evening dinners around the pool, anchored by the abundant flow of Umbrian wine were casual and carefree. The delicious nightly dining was not only a food lover jackpot but a wonderful social gathering featuring very interesting conversation among the guests. With discussion and opinions on politics, prose, business and the arts one could not help but feel reminiscent of European salons of the 18th century. As evening turned gently to night we watched the sun set gently over the horizon from our vantage nestled in the valley floor of the “breadbox of Italy” while gazing up at the lit up hillside of Assisi. Importantly we never felt that Suzy and Bill were pushing tours as much as they were treating us as guests in their home. They shared years of knowledge to make sure our experiences were great for us. I suggest you too leverage that knowledge by sharing with them what is you want out of your vacation. They will be prepared, they will arrange everything and you will have a great time. I hope you find the time and means to enjoy this wonderfully hosted vacation spot for a great time. Myself and 15 other family members have just returned from a fabulous vacation at La Fattoria Del Gelso. It was an ideal family trip in a most beautiful section of Umbria, Cannara. Wendy, Marco and Teresa made us feel right at home and we highly recommend at least one night of Teresa's superb Italian cooking.The location of La Fattoria is excellent for day trips to the many fascinating towns surrounding it. We especially enjoyed Deruta and Assisi. Some of us even travelled to Florence only a two hour drive. Truffle Hunting was a unique and fun experience for everyone. We can't say enough good things about our stay. La Fattoria was immaculate and inviting with plenty of room for all of us. We couldn't have picked a better place for our first trip to Italy. Dear Bill and Suzy: thank you for making our stay at Fattoria Del Gelso so memorable. We had such a special time mostly due to your help in arranging all of our many activities, and your staff's assistance in seeing those activities through. The house is charming, and even though we did not fill all the bedrooms, it did not seem to big for us (we were 8). Our smaller children loved running around the property and the bigger kids enjoyed the many outdoor sitting areas. The location of the house is superb, and, although we had excursions every day to the surrounding areas, we never felt overwhelmed. The girls agree that one of the highlights was our ceramics class in Deruta and the boys (big ones) said the Paolo Bea winery was a very special experience (my brother in law has even discovered where he can get Paolo Bea wine in Houston). The best part, however, was the birthday dinner that Theresa cooked, with the help of Wendy and Marco. It was the best meal we have had in all of Italy! When we left, my 7 year old son cried. That says it all! We just returned from a week in your beautiful home. It is such a perfect place for medium to large family gatherings. We packed 50 people into your dining room for Thanksgiving! The bedrooms were comfortable for the 15 who stayed.. so great to have so many bathrooms and private spaces in country home. We know Umbria well, but Cannara's location is so close to some of the prettiest spots in the area -- not to mention the great vineyards for wine tasting. Such great hospitality by your staff too, who were so attentive and helpful but also left us to enjoy in front of the fire too. Next time we will try a summer party when the pool is open. Thanks again! I arrived at the villa worn out and worn down after a family bereavement. It was the perfect getaway- beautifully quiet surroundings and a gorgeous pool, surrounded by fields of sunflowers. The interior decor is beauutiful and the kitchen up to commercial standards. I loved not having to drive everywhere-it's a short stroll into Cannara. But when you do get in the car Assissi, Foligno, Perugia are all on the doorstep. Javier will even explain the best spots to park. We were there for the Umbria Jazz Festival, and even if you chose not to go to the big events, Perugia was a great place just to hang out and watch the world go by. I left a lot more at peace than when I arrived, and would highly recommend the villa to anyone who deserves a break. Cooking classes, guided wine excursions, guided sightseeing excursions, photography classes, language classes, ceramics painting classes, and more! Weekly rentals only. Saturday (4pm check in) to Saturday (10am check out) only. A non-refundable deposit equal to 50% of rental total will be collected upon booking. Balance due 60 days prior to check in. Please obtain trip insurance to protect your investment in case of an unexpected or unavoidable cancellation.